The rate of a reaction may be measured by following the loss of a reactant, or the formation of a product. Three of the reactions which may be studied to show how the rate can be changed are shown. PARTICLE SIZE: The reaction between calcium carbonate and dilute hydrochloric acid. TEMPERATURE : The reaction between sodium thiosulphate solution and hydrochloric acid. CATALYST: The decomposition of hydrogen peroxide solution. The reaction between calcium carbonate and dilute hydrochloric acid. Hydrochloric acid + calcium carbonate → calcium chloride + carbon dioxide + water. The rate of this reaction can be measured by following the rate at which carbon dioxide is formed. This can be done by conducting the reaction in an open flask on an electric balance (weighing machine). As the carbon dioxide escapes to the air, the mass of the flask will decrease. You can take a reading from the balance every 30 seconds, then plot a graph of mass loss against time. The gradient of the plot (the steepness of the slope) shows the rate of the reaction (how fast it is going). A solid in a solution can only react when moving liquid particles collide with the solid surface. The bigger the area of the solid surface, the more particles can collide with it per second, and the faster the reaction rate is. You can increase the surface area of a solid by breaking it up into smaller pieces.A powder has the largest surface area and will have the fastest reaction rate. for the reaction with small marble chips (greater surface area). Note that the final loss of mass is the same for both reactions.This is because the same mass of calcium carbonate (marble chips) will give the same mass of carbon dioxide whether the chips are large or small. The smaller chips will just do it more quickly. The reaction between sodium thiosulphate solution and dilute hydrochloric acid. Hydrochloric acid + sodium thiosulphate → sodium chloride + sulphur dioxide + sulphur + water. The solid sulphur (S(s)) formed in this reaction makes the colourless solution go a cloudy, yellow colour. The reaction is usually carried out in a flask placed on a piece of white paper which has a black cross on it. At the beginning of the reaction, the cross can be seen easily. As the flask becomes more and more cloudy the cross gets harder to see. The decomposition of hydrogen peroxide solution. hydrogen peroxide → oxygen + water. The reaction is carried out in a closed flask which has a gas syringe connected to the top of it. The reaction is started by adding a catalyst to the hydrogen peroxide. Nothing much happens until we add a catalyst – the introduction agency. The catalyst here is manganese (IV) oxide. The volume of oxygen in the syringe increases as the reaction proceeds. The volume of oxygen can be noted every 30 seconds and a graph of volume against time can be plotted. The gradient of the plot (the steepness of the slope) shows how fast the reaction is going. We can measure the rate of reaction by following the change in some property of the reacting mixture over time. We can show the changing rate of a reaction by plotting a graph of amount of reactant remaining or amount of product formed against time. At any moment during the reaction: the steeper the slope of the graph, the faster the reaction at that point. The reaction finishes where the line levels off. Collision theory states that particles must collide before they can react, and that only collisions with sufficient energy (greater than the activation energy) will result in a reaction. Activation energy is the minimum amount of energy needed for a reaction to take place. Think of it as an entrance fee to a party. Increasing temperature increases the heat energy available in the system. 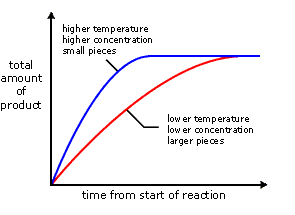 This allows for more successful reactions to take place, however activation energy is unchanged by temperature. Follow the link below to prepare for a short test next lesson. In 2010, there were 34 new posts, growing the total archive of this blog to 144 posts. There were 110 pictures uploaded, taking up a total of 8mb. That’s about 2 pictures per week. The busiest day of the year was November 22nd with 319 views. 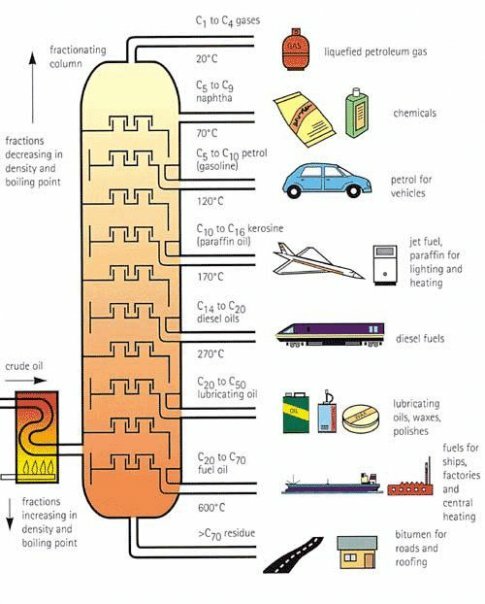 The most popular post that day was Fractional Distillation *updated*. The top referring sites in 2010 were 74.125.67.100, healthfitnesstherapy.com, statistics.bestproceed.com, alphainventions.com, and mekonik.wordpress.com. Some visitors came searching, mostly for fractional distillation, fractional distillation of crude oil, diffraction, bauxite, and parrot.